You have worked hard to build your business. Pinnacle Propane is committed to preserving your legacy. Have you considered selling your propane business but concerns for your customers and employees are holding you back? At Pinnacle Propane, our values of Customer Service, Integrity, and Safety emphasize providing the best possible experience for our customers and employees. We focus on providing local service to our customers and empowering our employees via competitive pay, a robust beneﬁts package, and advancement opportunities. As you think about next steps, let us work with you to develop a fair purchase plan and a seamless transition so that you can relax and enjoy the results of your eﬀorts. Call us today for more information and a conﬁdential assessment of your business. LPG companies owned by SHV Energy, the largest dedicated global LPG distributor. Pinnacle Propaneʼs operations include bulk gas storage and delivery, cylinder ﬁlling and distribution, and community gas systems. Learn more at www.pinnaclepropane.com. 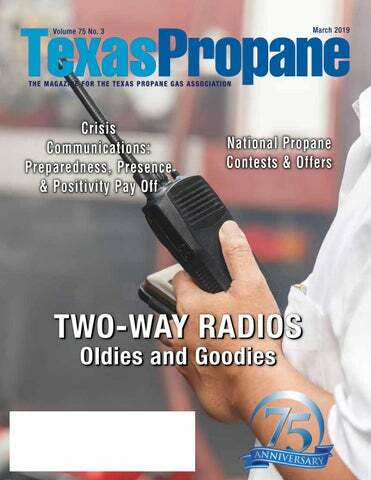 Features Oldies and Goodies. . . . . . . . . . . . . . . . . . . . . . . . . . . . . . . . . . . . . . 6 Two-way radios are staging a comeback to propaneâ&#x20AC;Śbut why? Sometimes “Old School” Is the Way to Go Bill Van Hoy TPGA Executive Director As propane marketers you use all types of leading-edge technology, but Mother Nature sometimes wreaks havoc (tornadoes, hurricanes, earthquakes - to name a few), and that technology can be rendered useless. What to do? Are you prepared? Turn to page 6 and read this month’s feature article - sometimes “old school” is the way to go and might result in some unforeseen benefits, like operational efficiencies. This month’s issue also gives you pointers on crisis communication. Weather events and customer incidents are almost completely out of a propane marketer’s control, and the industry does a pretty good job on the things it can control. Most propane businesses are not doing nearly enough to ensure they’re ready to deal with any sort of crisis. The article gives you good techniques that will help walk you through the event. I want to thank all of you who attended the 2019 Texas Energy Day in February. A recap of the events and photos will appear in next month’s issue of Texas Propane. As propane marketers know too well, natural disasters tend to be extra-disastrous for fuel businesses. “One of the fundamental pieces of advice I give my clients is this,” DeStefano offers. “Every person on the leadership team of every company – whether that’s a husband, wife, and son of a mom-and-pop shop or a dozen people at the helm of a propane business serving 15 states – they should be getting together at least monthly, if not weekly, to talk about the issues going on in the company, in their geographic market, and in their industry, so that they can be prepared.” Crystal DeStefano says these consistent, continual, communications meetings are the backbone of a solid crisis communications strategy. Examples of topics to be discussed include employee or customer issues at the company level, political or economic issues in your geographic market, or, at the industry level, any issues nationally that can affect either the operations or reputation of propane overall. Identify now who will serve as your spokesperson for different types of incidents that might occur. If you’re a smaller business, then you might have the same spokesperson for anything that happens. “But if the scenario is, for instance, a safety issue, and your safety director is calm, collected, and well-spoken in front of an audience or on camera,” suggests DeStefano, “then yes, you might want to use your safety director as your spokesperson on safety issues. But if the issue is related to customer service, or supply, or pricing, then you’ll probably want someone else to speak to those.” Also, DeStefano urges caution in sending out your company president or CEO at the first sign of crisis. If you might need to address the public about the event many times over the coming days, weeks, or months, then remember – you can always have someone higher up the chain of command take over as spokesperson, but it can never happen the opposite way; it will look like you’ve lost interest or caring about the crisis or issue at-hand. 6. Build a bridge: Bridging is a way to transition from a question you can’t or don’t want to answer, to a key message you can and do want to deliver. “You can’t just randomly start talking about something unrelated to the question; that’s weird and a reporter will call you out on it,” confirms DeStefano. “You want to acknowledge the question, then use this magical six-word phrase as your bridge: What I can tell you is …. Then follow it with the key message that most closely relates to the question asked.” 7. Use their deadlines: Whenever a journalist calls, take a message that includes their name, media outlet, reason for calling, contact info, and deadline. If they’re inquiring about an issue not specific to your company and you want to be included in their story, return their call promptly. If you don’t want to be included in their story, return their call, but wait until 20 to 30 minutes prior to their deadline. Often, they will have already talked to someone else and they don’t need you – but they will know you responded and did so prior to their deadline. If they’re inquiring about issues specific to your company, you don’t want them talking to anyone else; do your Critical Ten and return the call as soon as you can. 8. Say yes to dessert: At the close of an interview, reporters frequently ask whether you have anything else you want to add. “We call that dessert, and the answer is yes!” DeStefano exclaims. “This is a chance either to redo an answer from earlier that you want to deliver better, or to review your key messages and add one that you haven’t been asked about.” 9. There is no such thing as “off the record”: Monitor what you say and how you say it accordingly. 10. Realize that you are always on the record: “You are an official spokesperson for your company with anything you say to anyone – not just to the news media,” cautions DeStefano. “Whether you’re at the grocery store, at a barbeque, at your kids’ soccer game, it doesn’t matter. You’re always representing your business and your industry, so do your best to remember that in your everyday interactions with your friends and neighbors.” For more information about Crystal DeStefano or Strategic Communications, LLC, please visit www.StratCommLLC.com. — Set the parking brake, shut down the engine, activate signal flashers, set the wheel stops, check valves and containers for damage, and put out safety triangles to keep unauthorized people away from your vehicle. 3	Ensure safe conditions at the accident site — Check for fuel spills or hazardous materials, then move and stay a safe distance away. Make sure no one is hurt and call your supervisor. tance from the road, other vehicles, and potential ignition sources. 3	Use hazard warning signal flashers and warning triangles. However, flashers should be considered as a possible source of ignition. 3	Immediately exit the vehicle, take your documents with you, and get your fire extinguisher as a preventive measure to contain non-propane fires. 3	Determine if anyone is injured, and assist them if you are qualified to do so. 3	Move up-wind of a leak or vapor cloud, and only activate emergency shutdown devices away from the leak if it is safe to do so. Do not pass through an area with a leak or vapor cloud. areas or buildings, shut off the engine, exit the cab, and call the fire department. 3	Use your fire extinguisher to contain small fires if it is safe to do so. 3	One of the greatest risks of fire is caused by driving on a flat or soft tire. Never leave a smoking tire unattended. All accidents must be detailed on your company’s Accident Report Form and reported to the DOT. In addition to DOT reporting, you may be required to report to the Railroad Commission of Texas. Please see RRC LP Gas Safety Rule §9.36 for more on LP Gas Accident/Incident reporting. Discussion Topics 1. While driving a cylinder delivery truck, you smell a faint odor of propane. How do you respond? 2. You have been in a collision, and you detect a strong propane smell but cannot detect the source. What steps should you take? LEARNING ACTIVITY Stage an imaginary accident involving a vehicle that has a propane leak. Discuss all potential hazards and talk participants through your company’s safety actions. Source: Propane Delivery Operations and Cylinder Delivery (PERC) For additional information about handling accidents and emergencies, visit www.propane.com. materials violation that results in death, serious illness, or severe injury to any person or substantial destruction of property can be up to $186,610. One way to help with compliance is to join the Texas Propane Gas Association (TPGA). TPGA is always alerting our members of new DOT rule changes, reminding them of current requirements and providing guidance on current regulations when members have questions. Hear from one member how we have helped them. Danny Meyers President Bellville Butane Company Bill Van Hoy and the rest of the TPGA staff, I’m writing to express my appreciation for all that you do for the members of the Association. Your representation on behalf of the Association as a whole and your one-on-one help with the members is invaluable. The information supplied through the weekly newsletter helps us keep on top of current issues, upcoming events and reminders of deadlines. We as members have access to webinars, white papers, rule interpretations and regulatory guidance. The last, regulatory guidance, as it turns out, was of paramount importance to me recently. My company had a surprise inspection by the U.S. DOT. It was a bit nerve-racking to begin with, not knowing what they would ask for and if we were to be in compliance. But as we moved through the inspection, I found myself becoming more and more confident. They were asking for information and documentation and we were able to supply everything they asked for. At times the inspector, seeming surprised that we had what he asked for, wanted to know how we had all of this so readily available. He was particularly impressed with our Hazmat Security Plan. He asked if I had done that on my own. I was proud to say that I was able to have it because of the help of my propane gas association. He told his coworker, a new man in the training, that having an association to help with things like this sure pays off. He threw around large numbers when he was talking about fines for noncompliance. I’ve been in the propane business for many years; 42 to be exact. And I’ve learned a lot through the years. But I could not have come through the inspection with “no probable violations noted” if it had not been for your help. Your help and guidance through the years proved to be a life saver. I have been on the phone many times in the past and I’m sure I will be on the phone again in the future asking questions and getting answers. If I don’t get an immediate answer, I can always count on getting a call back with an answer. And also considering all of the discounts we get as members, the annual membership fee has paid for itself without question. You can know I will always renew my membership with TPGA. If you have anyone questioning whether they should become a member or if renewing their membership is “worth it”, you can refer them to me. Danny Meyers Bellville Butane Company P.S. Both of the US DOT officers were courteous, professional and personable. The experience ended up being a positive one. addressed this problem the way he approached many others – he decided to solve it himself. Captain King assembled a group of first-rate craftsmen at the ranch who made saddles of such fine quality that news of their superiority spread quickly. Within a few years of the end of the Civil War, the King Ranch Saddle Shop was providing saddles and tack not only for King Ranch, but for many others throughout Texas. Today, the King Ranch Saddle Shop is located in the historic John B. Ragland Mercantile Building that’s located in the heart of Kingsville and a few minutes away from the King Ranch Museum and King Ranch Visitor Center. Built in 1909 and listed on the National Register of Historic Places, the building housed the most preeminent department store south of San Antonio for many years. At the King Ranch Saddle Shop, you can find exquisite leather goods and quality outdoor gear for your next adventure. Additionally, you can watch a saddle being hand-made by our master saddle maker who continues to follow the spirit and tradition of the craftsmanship and timeless techniques that King Ranch has been long known for. ing, water heating, cooking, outdoor living, and backup generator. Offer pages can be accessed through digital ads or through callouts on Propane.com. Emails will vary based on the information completed in the form (what energy source is currently used, if they are a propane user and know/do not know their supplier, if they are building or remodeling and when they plan to build or remodel). Any current or potential user that does not currently know their propane supplier will receive a “find your supplier” message in each email. Those who do know their supplier will be encouraged to communicate with them as they’re building, remodeling, or looking for new appliances. This email program is automated to send users emails at specific periods of time based on when they complete the form and when they plan to complete their project. Once a winner is selected, PERC will reach out to the winner via certified mail to let them know that they have won and request that they contact PERC to talk about the prize. The winner will need to verify their propane supplier in order to win. If they don’t have a supplier, they would need to use the locator tool on propane.com to find their supplier before they are eligible to win. PERC will provide the proper tax/legal paperwork to the winner. PERC will communicate with the winner’s marketer to let them know that their customer has won a package of household appliances so that they are aware and can work with their customer accordingly. During this call, PERC would verify with the marketer if they have specific brands of products for the appliance(s) that they do not install or work with. PERC News Product brands will be determined by PERC and the winners’ marketers after a winner is selected. PERC will coordinate the purchase and shipping/delivery of the appliances with the winner and the marketer. Winners may be contacted by PERC over the following year for testimonial, feedback, information about their propane products. HEADQUARTERS White River Distributors, Inc. has loyaly served Texas since 1949. White River is an active and responsive force in the Texas propane industery. We have tanks 600 to 8000 gallons, your choice of chassis. White River can customize your bobtail to your specifications. New, used, and refurbished propane bobtails, change-overs, and repairs. Financing available. fering a great product or service. Millennials expect brands to help the community. This audience will spend more on a brand that relates to their personal values. Some of the most important values for this generation are honesty, compassion, and commitment to making the world a better place. They expect brands to showcase these values in public and online. Millennials want to be in control of their purchase at all times. If they are in the market for a product or service, they will compare their options online or ask their relatives and friends. When you are building your brand, it’s important to consider what options you can offer millennials. Some examples include pay as you go, premium services, among other options. Look for options that give the customer control over their decision and purchase. The millennial generation is all in for instant gratification. They want everything fast, easy and convenient. An example is how retailers such as Walmart, Amazon, and Whole Foods have added same delivery services. Also, the success of services such as Shipt and UberEats are signs that convenience reigns supreme with millennials. This generation wants to feel connected to the brand. When building your brand consider developing programs to make a social impact. Helping organizations can help you connect with the community and develop customer loyalty. An example would be a food brand joining Feed America to stop human hunger. How does your company help the community? Besides helping make the world a better place, it will show your customer that your company cares about everyone. The student loan debt crisis and low salaries have put millennials in a tough spot when it comes to their finances. They don’t have a lot of money to spend like other generations. Besides a tailored approach, millennials expect to be recognized. Loyalty rewards and memberships are a great way to recognize this audience while building your brand awareness. Consider using social media influencers and offering giveaways to get on the millennial radar. Recognition by the generation will promote brand loyalty. Can Your Brand Meet Millennials Expectations? Yes, your brand can meet the expectations of the millennial generation. The key to bringing in this audience is implementing the right millennial marketing strategies. How will your services or products improve their lives? What is your company doing to make the world better? What is the story behind your services or products? These are some of the questions that can guide your millennial marketing strategy. Don’t forget to include ways to engage with the audience online. D.L.Morrison Welding & Construction L.P.
People in Propane Rick Roldan has served as President and CEO of the National Propane Gas Association (NPGA) for 17 years and the industry for over 24 years. It was announced that he will be stepping down from the position. Mr. Roldan reported that he would remain with NPGA through the end of the calendar year to ensure a smooth transition to his successor, who hasn’t been named. For all your compliance materials & promotional needs. Decals, Signs, RIN decals, Red Tags, Meter Tickets, Books, Bill Stuffers, New Customer Packets, RTIC products, calendars, magnets, keychains … and more. with training resources, the assessment, or any ongoing campaigns — including new Propane Can Do That Consumer Marketing Campaign— just visit the PERC Help Desk. There, you can submit a question using the form, and PERC will be in touch with you as soon as possible. Check out the video at http://tinyurl.com/ perchelpdesk to learn how it works. Order in bulk to your office to hand out on your bobtail routes or provide us with a mailing list and the Propane Council of Texas will mail it for you. Just $45 and little over 3 cents per newsletter list processing fee for the spring issue. The Council covers the shipping and postage. Prices subject to change for future editions. 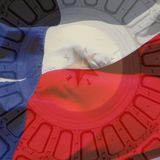 Subscribe your customers at http:// www.propanecounciloftexas.org/publications. Deadline is by March 8, 2019. Questions? Call (800)325-7427 or email info@propanecounciloftexas.org. Have an obituary or an announcement for People in Propane, send submissions to info@txpropame.com. Other propane owners have come to our agency to get help with connecting their insurance pieces: 1) Some have grown frustrated with the lack of timely response and personal service from their current agent. 2) Many have discovered a missing piece of coverage after meeting with us. 3) Most tell us they have no idea what companies insure their industry and are surprised to learn there are multiple options available. WWW.MARSHALLYOUNG.COM Subscribe your customers to the Propane Council of Texas’ Spring Propane Living newsletter to get propane educational & marketing information to your customers. TPGA Executive Director, Bill Van Hoy gives update to TPGA members on what Texas legislation the association is tracking at Legislative Update breakfast on February 19, 2019 in Austin, held in conjunction with the 1st Quarter Board Meeting. TPGA Members hear about legislation affecting the propane industry at a breakfast hosted by the Texas Propane Gas Association (TPGA) last month in Austin in conjunction with the 1st Quarter TPGA Board & Committee Meetings. Members can stay up to date on legislation affecting their business in the Under the Dome section of the Monday Morning Messenger this session. Eric Sears, State Engagement Program Manager for the National Propane Gas Association gives a NPGA Update and tells the Texas Propane Gas Association (TPGA) Board how to download the NPGAaction app on their phones. NPGAction is an advocacy app and is available at the Apple iTunes store and Android Google Play for all devices. TPGA Convention Planning convenes in February discusses 2019 conference plans for Corpus Christi and announces the Convention will be in Austin, TX in 2020. Autogas Dispensing for High Differential Pressure Applications. Lone Star Energy Group 19 Longhorn Propane 28 Lumbermen’s Insurance Agency 15 Marshall Young Insurance	25 Meeder Equipment Co.
rbex has publicly unveiled its Prime rocket for the first time at the opening of its new headquarters and rocket design facility in Forres in the Scottish Highlands. The rocket is designed to deliver small satellites into Earth’s orbit and is fueled by bio-propane. Get ready to put the Propane Education & Research Council’s new homeowner campaign, Propane Can Do That, to work for your business. Here are just a few of the ways PERC can help you succeed: • Visit PropaneLocalListings.com and update your Google business listing today. • Download the customizable Propane Can Do That homeowner toolkit from the resource catalog at Propane.com, and use it to promote your business. • Explore all the other gallon-growing resources available to you at Propane.com.